Your hearing is vital to keeping in touch with life’s essentials and pleasurable moments. From being able to walk safely on the street to enjoying your favourite TV show to engaging in social conversations, you need to hear clearly at all times. Whether your hearing is impaired due to aging, accidental injury, occupational noise exposure or loud music and incorrect use of headphones, you must choose a hearing aid in consultation with a hearing specialist. From extended wear to in-canal to in-the-ear, the choices are endless as each manufacturer strives to build just the right device. If you are looking for a technologically advanced, yet discreet hearing solution, look no further. For over 70 years, Swiss-based Phonak’s mission is to help those with hearing loss to hear clearly and live a safe, comfortable life. They have taken that a step further with their new customized, in-the-ear titanium aid. It goes to show that “strong things come in tiny packages”! Used in medical devices and high-tech sports equipment, titanium is known for its strength and durability. The Virto B-Titanium’s shell is as thin as a piece of paper with miniaturized electronic components. 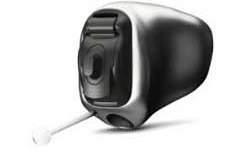 This powerful device is Phonak’s smallest custom hearing aid yet. Talk to the Hearing Instrument Specialists at Bravo Hearing and get to know the benefits of using the powerful, yet discreet Phonak Virto B-Titanium for correcting your hearing loss. Custom-made from medical grade titanium – Titanium is extremely strong, durable, and light-weight. Rest assured that it stands up to use, yet you will barely notice wearing it. Super discreet – Custom-fit with the precise impression of your own ears. The Virto B-Titanium is so small that others will see your smile, not your hearing aid. 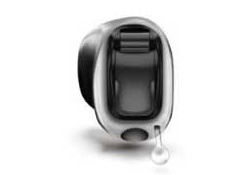 It is the smallest Phonak in-the-ear hearing aid made. Fully automatic – AutoSense OS technology adapts to your surrounding environment every 0.4 seconds. It knows when you are in a noisy restaurant or at home, in a concert hall or in a car. The Virto B-Titanium monitors and adjusts seamlessly for you, giving you the best quality of sound, no matter what activity you are engaged in. No more need to manually adjust your hearing aid. 60% improved speech understanding in the middle of all the noise. The technology hones in on a single voice in a noisy environment. 20% better speech understanding in everyday situations thanks to automatic, hands-off program selection. 37% reduction in listening effort while in the car as compared to prior technology. 10% improved soft speech understanding. Improved music sound quality from a top-rated hearing aid. Phonak’s Virto B-Titanium works for you and your degree of hearing loss. Your hearing specialist can sit down with you to assess how this custom-made, fully automatic, titanium gem can improve your quality of life. The benefits of the Phonak Virto B-Titanium are a testament to Phonak’s dedication to you. Deciding if the Virto B-Titanium is the right choice, you will require a thorough consultation, a hearing test and a trial. To see if a Phonak hearing aid is right for you, call the experts at Bravo Hearing Centre today at 647-694-4626. We can arrange a complimentary consultation at your earliest convenience. You can also book a free consultation online. Your hearing is vital to keeping in touch with life’s essentials and pleasurable moments. From being able to walk safely on the street to enjoying your favourite TV show to engaging in social conversations, you need to hear clearly at all times.